Wu, P., Li, J., He, T., and Hu, C. (2019). "The direct conversion of hemicelluloses to selectively produce xylose from corn stover catalysed by maleic acid," BioRes. 14(1), 816-841. The direct conversion of hemicellulose in corn stover to xylose while avoiding further degradation in water by using maleic acid as a catalyst was studied. When 0.06 M maleic acid was added, a 96.8 wt.% hemicellulose conversion was achieved, with relatively low conversion of cellulose (24.1 wt.%) and lignin (20.7 wt.%) at 140 °C for 2 h, and a relatively high yield of 22.5 wt.% (95.5 mol%) to xylose was achieved. Maleic acid interacted with the open form of xylose via hydrogen bonding to stabilize xylose, whereas its further degradation pathway was blocked, which led to improved yield and selectivity. The conversion of hemicellulose in bamboo, apple tree, straw, and mulberry to produce xylose (at 140 °C, for 2 h) catalyzed by maleic acid was also effective (Ya = 17.8 wt.%, Yb = 127.1 mol% xylose yield for hardwood and Ya = 25.1 wt.%, Yb = 109.6 mol% yield for grass) under the same conditions. Efficient and economical conversion of lignocellulosic biomass has become one of the most promising methods for producing chemicals in a renewable way (Somerville et al. 2010; Huang and Fu 2013; Xiao et al. 2013). Lignocellulosic biomass is composed of hemicellulose, cellulose, and lignin. Hemicellulose is the second largest carbohydrate component of lignocellulosic biomass, and it is a general term for a class of complex polysaccharides (Ormsby et al. 2012; Sahu and Dhepe 2012; Carà et al. 2013; Zhou et al. 2013; Xu et al. 2015) mainly composed of several different types of pentose sugars (β-D-xylose, α-L-arabinose), hexose sugars (β-D-glucose, β-D-mannose, α-D-galactose, α-L-rhamnose, and α- L-fructose), and uronic acids (α-D-glucuronic acid, α-D-4-O-methyl- glucuronic acid and α-D-galacturonic acid) (Mamman et al. 2010). Hardwood hemicelluloses, for instance, are mostly comprised of xylans, whereas softwood hemicelluloses contain glucomannans (Gírio et al. 2010). A typical composition of hemicelluloses (Gírio et al. 2010; Mamman et al. 2010) is presented in Table 1. Although hemicelluloses occupy a relatively large amount of the polysaccharide fraction, they are usually removed and discarded to improve the accessibility of enzymes to cellulose (Yang and Wyman 2004; Huang and Fu 2013) and make the remaining cellulose fraction more readily digestible. The possible pathways of transformation of hemicelluloses in a hydrothermal process for lignocellulosic biomass have been explored (Lu and Mosier 2008; Peng et al. 2012; Gürbüz et al. 2013b; Nitsos et al. 2013). The objective of these efforts is to improve the efficiency and selectivity of hemicellulose hydrolysis, obtaining monomeric sugars. The depolymerization of hemicellulose produces xylan oligomers, monomeric xylose units, or a mixture of both C5-C6 monomeric sugars, which could be used as key building blocks of biofuels and platform chemicals for either drop in or new applications (Sahu and Dhepe 2012). Xylose, a typical monomeric sugar, is a five-carbon sugar that mainly exists as a pyranose ring, furanose ring, or as an open-chain structure in water. Although known for its use in sweeteners, xylose is also an important chemical intermediate in furfuryl alcohol, THFA, and pentanediol production (Salmi et al. 2014). Xylose is mainly produced from xylan-rich lignocellulosic materials via acid or enzymatic hydrolysis (Ebringerová and Heinze 2000). However, it is a great challenge to obtain such sugars from lignocellulosic biomass because of the difficulty of separating cellulose and hemicellulose from lignin, and hemicellulose from cellulose (Farhat et al. 2017). On the other hand, degradation of xylose into small molecules such as furfural (Gürbüz et al. 2013a; Wang et al. 2015), lactic acid (Walton et al. 2010; Yang et al. 2015), and γ-valerolactone (Zhu et al. 2016) occurs during the hydrolysis process. Furthermore, the reaction to form humins or other degradation products is irreversible, and such compounds are intractable for valorization. Many methods for the treatment of lignocellulosic materials have been investigated, such as dilute acid pretreatment (Sahu and Dhepe 2012; Nakasu et al. 2016), alkaline peroxide extraction (Sun and Sun 2002; Alvarez-Vasco and Zhang 2013), liquid hot-water extraction (Vallejos et al. 2015), stream treatment (Carvalheiro et al. 2008), microwave treatment (Jankerobermeier et al. 2012), ionic liquid extraction (Lan et al. 2011; Sun et al. 2012; Dong et al. 2013; Froschauer et al. 2013), ammonia treatment (Saenger et al. 1983), and so on. The method which can be employed for selective hemicellulose conversion is highly dependent on the final application of the recovered products. Among the many different types of pretreatments available, dilute acid treatment and enzymatic hydrolysis (Puls 1997; Várnai et al. 2010) are particularly promising because they eliminate the need for the addition of a chemical catalyst or for detoxification after treatment. Enzymatic hydrolysis is mild and environmentally friendly (Zhao et al. 2012), but the starting materials are often sensitive to the enzymes and it is difficult to find an enzyme suitable for many different substances. Raw materials typically have been pretreated to extract xylan or make them more digestible to subsequent enzymes. Acid treatment is thought to be a mature and effective method for the hydrolysis of hemicellulose. However, significant degradation of sugars is unavoidable if there is high sugar concentration in acidic solution. 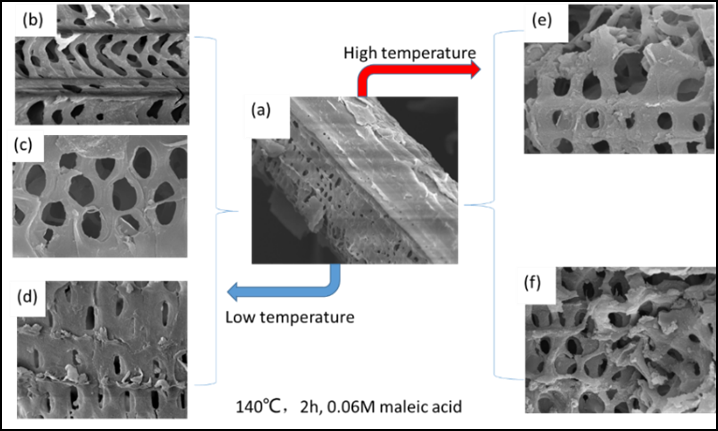 There are two main challenges to the better utilization of lignocellulosic biomass: the recalcitrant nature of lignocellulosic biopolymers and the efficient hydrolysis of these biopolymers into sugars or high-value products (Zhang et al. 2007). Although significant progress has been made on applications of dilute acid to biomass treatment in recent years, there is still basic work to be done. For example, selective acid hydrolysis of hemicellulose to produce sugars without further degradation has been scarcely studied in literature; despite the multitude of publications on the dependencies of different parameters on the activity and selectivity of hydrolysis (Mäkiarvela et al. 2011), there is still a lack of systematic reports on the effects of different raw materials and acid types. The treatment of lignocellulosic biomass using non-toxic catalysts and water as the solvent is an attractive, green process. Compounds with multiple carboxylic acid moieties are stronger acids than monocarboxylic acids, both in number of protons available for donation to a base and by virtue of lowered pKa’s for the individual carboxylic acid moieties. Maleic acid, as a dicarboxylic acid, has attracted increasing interest because of its good catalytic ability for polysaccharide depolymerization and its especially high khyd/kdeg ratio (Lu and Mosier 2008; Zhang et al. 2015; Zhang 2016), which favors the hemicellulose hydrolysis to xylose over xylose degradation. As a relatively stable carboxylic acid, maleic acid has the potential to be recycled. In this study, the depolymerization of hemicellulose catalyzed by maleic acid was investigated for producing xylose directly from raw biomass with high yield and selectivity and without significant sugar degradation. All experiments were conducted in a 300 mL stainless steel autoclave reactor equipped with a temperature controller and a magnetic stirring device. A total of 3 g of corn stover powder and 100 mL deionized water were mixed with the designated amount of organic acid in the reactor. The interior air was completely replaced with high purity nitrogen (99.99%) for 3 min, and the initial pressure in the reactor was increased to 2.0 MPa with nitrogen. The system was heated from room temperature to the desired one and, thereafter, kept constant (with the precision of 1 °C) for the designated time, and then cooled via water flow to ambient temperature to end the reaction. It required 30 min to 35 min to heat the system to 140 °C. The cooling to ambient temperature also took about 30 min. The system was stirred with a magnetic stirring device at 400 rpm, and the reaction mixture was filtered to separate the solid residue from the liquid phase. Triplicates were run for each reaction conditions, and the standard errors were computed for each point. The standard deviations were less than 5%. The apple tree was obtained from Weihai County in ShanDong Province in China, and ramulus mori, obtained from Ningnan County in Sichuan Province in China. The straw samples were obtained from Jintang County in Sichuan Province in China, and the bamboo sample was obtained from Anji County in Zhejiang Province in China. The Corn stover was obtained from Fushun of Liaoning province in China. All samples were dried and milled to the size range that passed through an 80 mesh screen and retained on a 120 mesh screen before use. The sample was washed three times and dried in an oven at 100 C overnight to remove water for further processing. All the other chemicals were purchased and used as received. The classical chemical titration method (Van Soest method) was employed to analyze the variation of the three components (hemicellulose, cellulose, and lignin) of the raw materials and solid residues obtained under different reaction conditions. The details of the titration were described previously (Qi et al. 2006; Hu et al. 2014). There are also some other components such as ash, lipid, and protein in lignocellulose, which might also affect the dissolution of each component. However, since they were the same, their effect might be systematic, which would not affect the discussion of the experimental results in the present work. Thus, their influence was ignored in the present discussion. The FTIR spectra of the solid samples were recorded on a Nicolet 6700 Fourier transform infrared spectrophotometer (Waltham, MA, USA) in the range of 4000 cm-1 to 400 cm-1 with a resolution of 2 cm-1. A total of 1 mg of dried samples was blended with 100 mg of KBr and pressed into thin pellets before measurement. where I002 is the peak intensity corresponding to the (002) (2θ = 22°) lattice plane of the cellulose, and IAM is the peak intensity observed at 2θ = 18°. I002 represents both crystalline and amorphous material while IAM represents amorphous material only. The SEM characterization was performed on an Inspect device and run at an acceleration voltage of 20 kV. To improve the conductivity of the samples and the quality of SEM images, samples were coated with gold using a vacuum sputter-coater. where Wr was the weight of raw material (g) and Wf was the weight of final residue (g). In order to evaluate the selectivity of xylose formation, the method proposed by Sahu and Dhepe (2012) was used. The assumptions of this method are as follows: Hemicellulose is mainly composed of xylose units and the glucose component is relatively low (not more than 15%). The molecular weight of xylose (C5H10O5) is 150 g/mol. The formation of the polymer releases water (MW 18 g/mole). To simplify the calculations, the molecular weight of hemicellulose was considered to be 132 according to reference (Sahu and Dhepe 2012). Results from a Shimadzu LCMS-IT-TOF ESI-MS (Kyoto, Japan) were collected to analyze the possible chemical structure of liquid products. The instrument was operated in continuum mode with the following parameters: ionization voltage of 4.5 kV, interface temperature of 250 °C, nebulizer gas (N2) flow of 90 L·h-1, detector voltage of 1.6 kV. Raman spectra were recorded using an Horiba R-XploRA Plus (Paris, France) with the excitation wavelength at 532 nm. The Raman spectrometer was equipped with an optical microscope (BX41, Olympus) for focusing. The Raman shift was calibrated with a silicon wafer. All Raman spectra of the liquid samples were collected at room temperature under ambient pressure. According to Stein et al. (2011), dicarboxylic acids can selectively hydrolyze hemicellulose over a temperature range of 80 °C to 140 °C. A series of experiments were carried out over the temperature range of 80 °C to 180 °C with 0.02 M maleic acid added so that the effects of several parameters on corn stover degradation could be observed. According to the results of the chemical titrations, the dried corn stover was composed of 20.9 wt.% hemicellulose, 49.6 wt.% cellulose, and 20.3 wt.% lignin. The 9.2 wt% remaining materials are mainly ash, lipid and protein. The reaction temperature had a remarkable influence on the conversion of the three major components. As shown in Fig. 1(a), the conversion of hemicellulose was noticeably different from that of cellulose and lignin. Fig. 1. These figures show the influences of reaction temperature. Shown in part (a) is the conversion of the three main components and, in (b), the yield of liquid products. Reaction conditions: 3 g (corn stover), 2 MPa N2, 2 h, 100 mL water, 0.02 M maleic acid. While easily degradable components in corn stover were initially converted at 80 °C, the conversion of the three components seldom increased during reaction at temperatures in the range from 80 °C to 100 °C. When the temperature was raised from 100 °C to 120 °C, the conversion of hemicelluloses increased rapidly from 25.9 wt.% to 62.9 wt.%. However, during the same time, the conversions for cellulose and lignin slightly changed from 11.5 wt.% at 100 °C to 15.0 wt.% at 120 °C, and 1.4 wt.% at 100 °C to 7.1 wt.% at 120 °C, respectively. Higher temperatures (over 120 °C) boosted the conversion of cellulose and lignin, however, the rate was much slower than that of hemicellulose. Thus, controlling the temperature can greatly improve the conversion of hemicellulose while also avoiding a certain degree of significant conversion of cellulose and lignin. When the temperature was increased over 160 °C, it showed obvious, disruptive effects on the crystalline regions of cellulose. As shown in Fig. 1(b), even at a low temperature of 80 °C, a certain number of small molecular compounds (in addition to monosaccharides), such as formic acid, acetic acid, and HMF, were detected. The presence of these compounds meant that, in the process of stripping the corn stover, degradation of part of the dissolved hemicellulose and cellulose occurred. When the temperature increased from 80 °C to 140 °C, the yield of target product, xylose, increased from 0.2 wt.% (Yb = 0.7 mol%) at 80 °C to 17.0 wt.% at 140 °C (Yb = 72.2 mol%) while the amount of small molecular products remained at a low level. A further increase in temperature inevitably promoted the formation of degradation compounds. Fig. 2. The influence of reaction time on: (a) the conversion of the three main components and (b) the yield of liquid products. Reaction conditions: 3 g (corn stover), 2 MPa, 140 °C, 100 mL water, 0.02 M maleic acid. On the other hand, glucose makes up 7% to 9% of the hemicellulose in corn stover (Lavarack et al. 2002) and the distribution patterns of side chains in heteroxylans also occupy a small percentage. That is to say, the yield of xylose obtained was relatively high. Therefore, 140 °C can be a proper reaction temperature, which was lower than that reported (160 °C) in literature (Kim et al. 2012). Next, the temperature was maintained at 140 °C so that the impact of other parameters could be evaluated. For the reaction time, according to Figs. 2(a) and 2(b), the conversion of the three main components increased rapidly in the first 0.5 h. However, while the increase of conversion rate of hemicellulose remained fast with a further increase of reaction time up to 2 h, while that of cellulose and lignin slowed down. In particular, after 2 h of reaction (Fig. 2(a)), almost complete conversion of hemicellulose was achieved and the conversion of lignin (23.6 wt.%) and cellulose (26.8 wt.%) only changed slightly with longer reaction time at 140 °C. The yield of the main product xylose increased with reaction time. However, the rate at which the yield increased slowed down because of an almost complete conversion of hemicellulose (95.6 wt.%) after 2 h. In fact, increasing the reaction time increases the difficulty of obtaining a higher selectivity of xylose because of the formation of humins through side reactions. On the other hand, shorting the reaction time could improve the economics of producing value-added chemicals for use. Therefore, a 2 h reaction time may be the best choice. Fig. 3. The influence of the concentration of maleic acid on: (a) the conversion of the three main components and (b) the yield of liquid products. Reaction conditions: 3 g (corn stover), 2 MPa N2, 140 ℃, 2 h, 100 mL water. It was obvious that the conversion of the three components increased with the addition of maleic acid. As shown in Fig. 3(a), the concentration of maleic acid had a clear effect on the dissolution of hemicellulose until it reached 0.06 M, where no further notable degradation of cellulose and lignin was attained. However, the conversion of hemicellulose only slightly improved while that of cellulose remained stable when the concentration of maleic acid was higher than 0.06 M. Additionally, the conversion of lignin increased from 24.6 wt.% to 36.2 wt.%. To selectively convert hemicellulose while leaving as much cellulose and lignin as possible, 0.06 M could be an appropriate concentration. According to the above data, the optimum reaction conditions were fixed at 140 °C, for 2 h, and a maleic acid concentration of 0.06 M. Under these reaction conditions, a 96.8 wt.% conversion of hemicellulose from corn stover with a maximum xylose yield of 22.5 wt.% (Yb = 95.5 mol.%) was obtained. The optimized reaction temperature and concentration of maleic acid were both much lower than those which have been reported in other works (150 °C / 170 °C, 0.2 M) (Lu and Mosier 2007; Lu and Mosier 2008). This might be caused by different raw materials used. Although similar acid concentrations (0.05 M and 0.09 M) were used (Qin et al. 2012), the product they obtained were diverse and the selectivity to xylose was not optimized. The raw material and solid residues treated at different reaction temperatures were characterized by FTIR, XRD, and SEM analyses. The FTIR spectra were recorded over the range from 4000 cm-1 to 400 cm-1 and the FTIR changes were mainly concentrated in the “fingerprint” regions, as shown in Fig. 4 (the whole spectra are given in Fig. S1 and typical features are listed in Table S2). The most pronounced band, at about 1050 cm-1, for raw material split into two new peaks at 1059 cm-1 (assigned to C-O stretching at C-3 in cellulose) and 1032 cm-1 (assigned to C-O stretching at C-6 in cellulose), and these two new bands become more obvious with increasing treatment temperatures. That is to say, either the absorbance of cellulose and hemicellulose overlapped in that region or the interaction between hemicellulose and cellulose resulted in the bands at about 1050 cm-1. Additionally, the two characteristic peaks of cellulose could become obvious only when hemicellulose was removed. The macroscopic changes were reflected in changes in the surface structure of corn stover. As shown by SEM, when the raw material was treated at low reaction temperatures 80 °C (Fig. 4(a)), 100 °C (Fig. 4(b)), and 120 °C (Fig. 4(c)), the surface and pore structures of the corn stover changed progressively and, when the treatment temperatures were increased to 140 °C, the damage greatly increased. That is to say, the skeletal structure of the corn stover began to get destroyed. Cellulose in corn stover is a liner polymer composed of D-glucopyranose units linked by β-1,4-glycosidic bonds. A number of intra- and inter-molecular hydrogen bonds between the hydroxyl groups in cellulose results in various ordered crystalline arrangements. The crystallinity index (CI) had been identified by their characteristic X-ray diffraction (XRD) patterns and were used to describe the relative amounts of crystalline regions in cellulose. As shown in Table 1, the CI of cellulose increased with increasing treatment temperatures. The XRD patterns of the residues changed slightly after being treated at 120 °C (or lower temperatures), which suggested that the crystalline structure of cellulose in the residues remained perfectly. 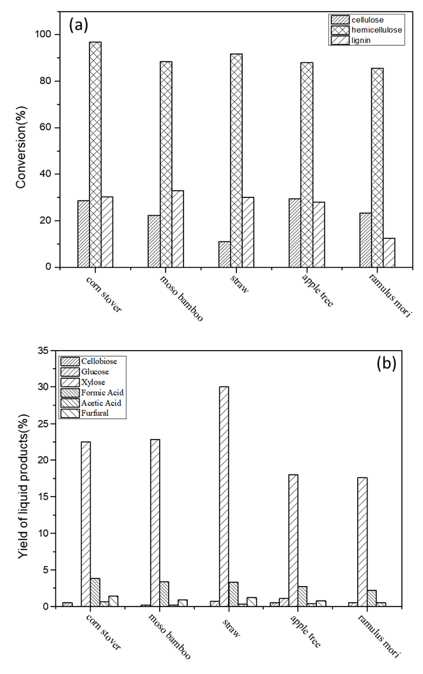 However, increasing the treatment temperature to 160 °C, the cellulose crystallinity index in the residue was much higher than that of corn stover (the XRD patterns are given in Fig. S2). This agreed well with the results from the chemical titration, that is, the structure of the lignocellulose complex was damaged and the crystal structure of cellulose become neater after the conversion of hemicelluloses and other easily degradable portions at 160 °C. When the hemicellulose part was extracted from corn stover with 0.06 M maleic acid, fibrils appeared to form a more compact structure. Fig. 4. The SEM images of corn stover which was: (a) untreated, (b) treated at 80 °C，(c) treated at 100 °C, (d) treated at 120 °C, (e) treated at 140 °C, (f) treated at 160 °C. Reaction condition: 3 g (corn stover), 0.06 M maleic acid, 2 MPa N2, 2 h, 100 mL water. According to the chemical titration, parts of cellulose and lignin were converted and the extent of conversion increased with the treatment temperature. However, the intensities of the cellulose peaks became stronger after the reaction, even at 160 °C. In other words, the crystalline cellulose remained perfect, and it might be the conversion of amorphous cellulose which caused the decrease of cellulose content. The reaction system was efficient for selective conversion of hemicellulose. The ESI-MS/MS analysis of aqueous-phase products with a maleic acid catalyst in aqueous solution at different reaction temperatures was performed. In all cases, the small molecular products such as [AA+Na]+ (83.0222) and [FF+H]+ (m/z = 97.0403) were detected. These agreed well with HPLC results, which also suggested that there were some degradations of monomeric sugar, regardless of low or high reaction temperatures. On the other hand, both xylose-maleic acid and 2 xylose-maleic acid were detected in LC/MS spectrum, where the peaks at m/z = 267.063 and m/z = 399.1788 were assigned to [xyl+MA+H]+ and [2xyl+MA+H]+, respectively. Fig. 5. 13C-NMR spectra of xylose and corn stover samples and the positive ion mode of ESI MS/MS spectra of aqueous-phase products in aqueous solution obtained at 140 °C: (a) xylose, (b) maleic acid, (c) xylose + maleic acid in water, (d) xylose + 140 °C + 2 h, (e) maleic acid + corn stover, (f) xylose + maleic acid + 140 °C + 2h, (g) maleic acid + corn stover + 2 h, (f-1) δc from 200 ppm to 160 ppm part of fig(f), (g-1) δc from 200 ppm to160 ppm part of fig(g), (h) ESI MS/MS spectra of aqueous-phase products at 140 °C. When maleic acid gets close to the xylan, new hydrogen bonds form, which might stabilize the xylose in the open chain. Effects of maleic acid in stabilizing xylose can also explain why maleic acid alone showed superior selectivity for sugar yields compared to other carboxyl acids (the ESI-MS/MS spectra are shown in Fig. S3). It is also possible that the [xyl+MA+H]+ and [2xyl+MA+H]+ could be formed during ionization as the form of cluster ions. Thus, more characterizations were needed to confirm the possible formation of these species in the reaction. To confirm the intermediate products formed in the reaction system, 13C-NMR spectra of maleic acid, xylose, and the mixture of both were tested, as shown in Fig. 5. The characteristic carbon peaks which appeared at 96 ppm and 92 ppm corresponded to the C1’s of β-D-xylose and α-D-xylose. 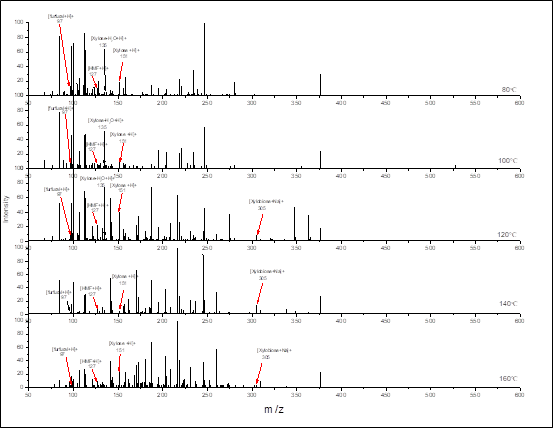 On the other hand, maleic acid gives characteristic peaks at 170 ppm and 132 ppm which correspond to C1’s and C2’s in the maleic acid molecule, as shown in Fig. 5(b). When simply mixing xylose with maleic acid (Fig. 5(c)) or maleic acid with corn stover without heating (Fig. 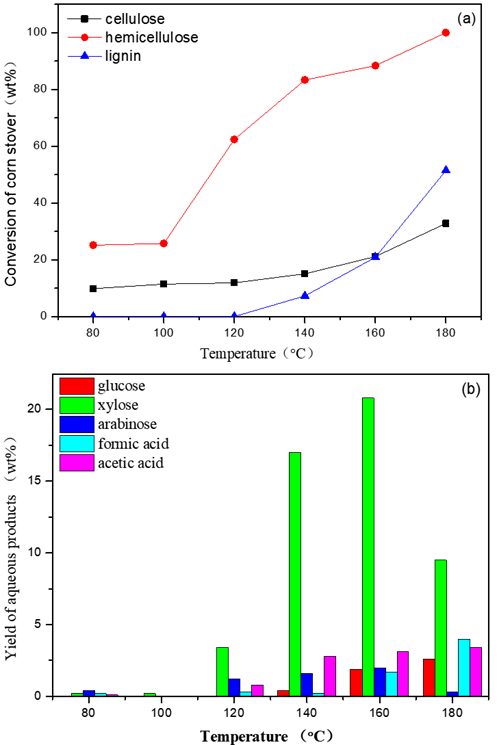 5(d)), the characteristic peaks of maleic acid, β-D-xylose, and α-D-xylose remained unchanged; the interactions between maleic acid and corn stover were weak. When heating with xylose, the relative position of the characteristic peaks of C1 and C2 (δc = 170 ppm and δc = 132 ppm) shifted 0.4 ppm (Figs. 5(f) and 5(g)). In addition, when pure xylose (Fig. 5(d)) was treated at 140 °C for 2 h, no peaks in the field of 200 ppm to 160 ppm were found. However, there was an obvious peak that appeared in low field at 199 ppm, indicating the formation of an aldehyde, when the xylose with maleic acid (see the Figs. 5(f-1)) and corn stover with maleic acid (see the Figs. 5(g-1)) systems were treated at 140 °C for 2 h, respectively. That is to say, the open chain form of xylose only appeared when maleic acid co-existed with substrates. 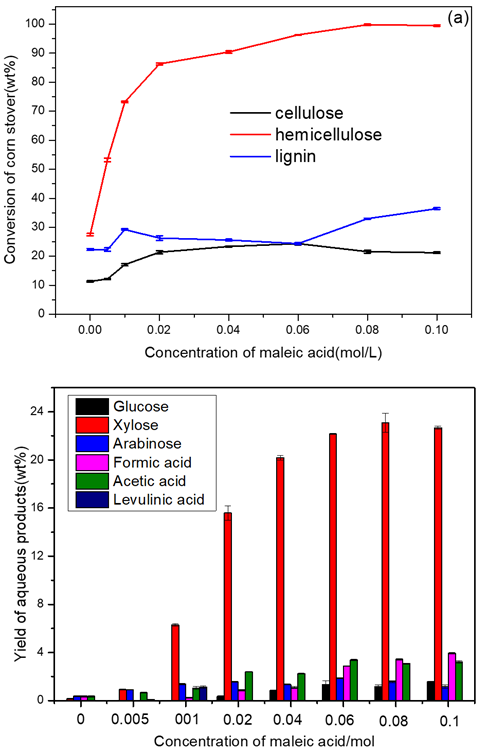 To further study the interactions between maleic acid and xylose, a Raman analysis of the xylose aqueous solution with maleic acid were carried out. As shown in Fig. 6, compared to pure xylose heated at 140 °C, there was an obvious blue shift from 973 cm-1 to 986 cm-1 with maleic acid addition, assigned to C5H5a/C5-H5b, indicating the involvement of C5H5a/C5-H5b in xylose and maleic acid. 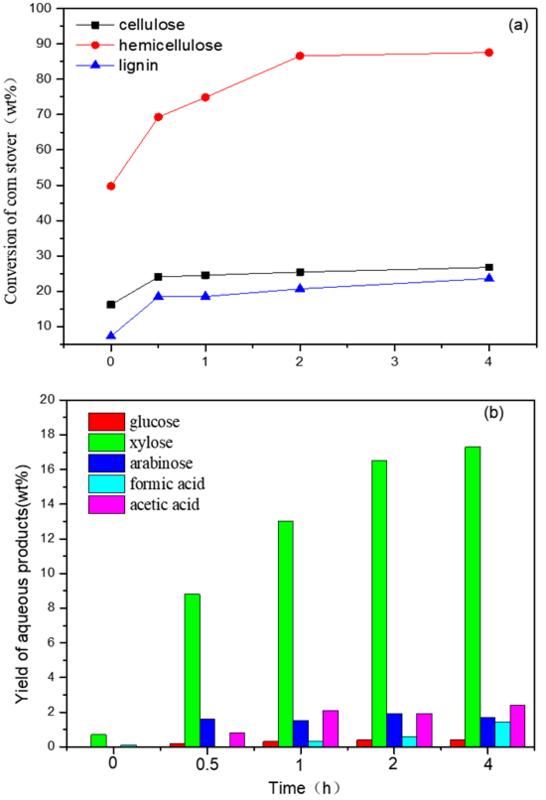 At the same time, the 1116 cm-1 peak shifted to 1123 cm-1, which demonstrated that the stretching vibration of C5-O6 of xylose changed when maleic acid was added (the attribution of each peak is summarized in Table S3). The results were in agreement with LC/MS results. Fig. 6. The Raman spectra of (a) pure xylose, pure maleic acid, and the corresponding mixture after reaction at 140 °C from 400 cm-1 to 1800 cm-1, (b) pure xylose, pure maleic acid, and the subsequent reaction at 140 °C from 800 cm-1 to 1200 cm-1. As shown in Fig. 5, xylose remained as the open chain form in aqueous solution and interacted with maleic acid via H-bonds to stabilize it. Combined with the results of LC/MS and 13C NMR, it could be inferred that this was caused by the breakage of the C1-O6 bonds of xylose when maleic acid co-existed with the substrate, stabilizing the open chain form of xylose. The dissolution of hemicellulose and interaction between xylose and maleic acid to cut off the path to degradation of xylose are shown in Fig. 7. The degradation reaction of hemicellulose took place in several stages. First, xylan in hemicellulose was hydrolyzed to oligomers. Then, xylose was formed and, finally, the xylose degraded. To further understand the reasons and thus learn how to avoid undesired degradation reactions and achieve improvements in xylose yields from pentosan-rich materials, the conversion of xylan and xylose at 140 °C for 2 h with 0.06 M maleic acid as catalyst was comparatively studied. Similar to the breakage of hemicellulose, the degradation of corresponding oligomeric and polymeric saccharides to monomeric saccharides and other by-products (such as formic acid, acetic acid, and furfural) by further degradation occurred during the hydrolysis of xylan. From Table 2, after thermal hydrolysis of xylan at 140 °C for 2 h, a maximum xylose yield of 100 wt.% (including the added water by hydrolysis) was obtained from the conversion of xylan. Hence, the maleic acid showed strong performance on the degradation of polymeric saccharides to monomeric saccharides. The role of maleic acid could be explained again by intermolecular hydrogen bonding. Under the giving reaction conditions, the first protons could be fully dissociated while the second hydrogen was much harder to dissociate because of internal hydrogen bonds. Thus, the pH values of the reaction system were easily controlled, improving the reaction environment. On the other hand, when xylose was heated in pure water at 140 °C for 2 h, the remaining xylose in water was 91.8 wt.%, indicating the degradation of a small portion of xylose. However, the remaining xylose increased to 94.3 wt.% when maleic acid was added in the reaction system. The results were similar to those in which corn stover was used as the substrate. Maleic acid was indeed effective in promoting the degradation of polymeric saccharides to monomers while restraining the further degradation of xylose. In addition, the pH values of maleic acid solutions with and without corn stover, without any further treatment, were measured. The pH value of 0.06 M maleic acid solution was 1.69 (without corn stover) and it increased to 1.80 when corn stover was added. Thus, H+ can be effectively absorbed onto the surface of corn stover and thereby reduce the concentration of hydrogen ions in solution. In fact, as shown in SEM (Fig. 4), there were a multitude of pore structures in corn stover, which may have promoted the interaction between maleic acid and hemicellulose. Hence, proper temperature and acid concentration were necessary for the selective conversion of hemicellulose. Based on the above results, the reaction system was expanded to include the selective conversion of hemicellulose in other typical raw materials (bamboo, apple trees, corn stover, straw, mulberry, and ramulus mori) to produce xylose under the same reaction conditions. The results are shown in Table 3. When using maleic acid as a catalyst, high conversions of hemicellulose was achieved (87.9 wt.% for apple tree, 85.6 wt.% for ramulus mori, 91.7 wt.% for straw, 88.4 wt.% for bamboo, and 96.8 wt.% for corn stover). It is known that bamboo, corn stover and straw belong to grass species while the mulberry and apple tree belong to wood species. The average conversion of grass species (92.3 wt.%) was a little higher than that of the wood species (86.8 wt.%). 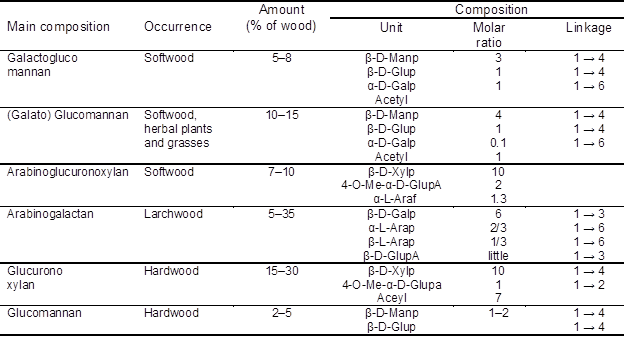 When comparing the yields of xylose from different raw materials, it was observed that the average yield of xylose from grass species was higher than that from wood species: 18.0 wt.% (89.2 mol%) for apple tree, 17.6 wt.% (141.8 mol%) for ramulus mori, 30.0 wt.% (111.8 mol%) for straw, 22.8 wt.% (121.4 mol%) for bamboo, and 22.5 wt.% (95.5 mol%) for corn stover (the detailed conversions of the three components of different raw materials and corresponding product distributions are shown in Fig. S4 ). Hemicellulose is complicated not only in the composition but also in structure. If hemicellulose is simply regarded as a linear xylan to estimate the hydrolysis of xylan to xylose, then one extra weight of water is added to xylose. If the xylose is linked with a net structure (Farhat et al, 2016), more than one extra water would be added to the weight of xylose obtained. The Yb and Yc could be over 100% because of the added weight of water. The method of calculation is rough, but it didn’t affect our evaluation of xylose selectivity. This results also implied that the assumptions proposed in Eq. 3 could not apply to some raw materials. The properties of woods which made them excellent and durable building materials were also responsible for making them recalcitrant substrates for hydrolysis and rendering subsequent synthesis of chemicals (Mamman et al. 2010). Thus, it was reasonable that both the conversion of hemicellulose and yield of xylose from wood species were lower than those for grass species. That is to say, for different kind of raw materials, maleic acid exhibits general ability to selectively convert hemicellulose and produce xylose with high yield in water. 1. Effective conversion of hemicellulose and selective production of xylose were achieved by hydrothermal hydrolysis of corn stover with maleic acid as catalyst and water as solvent. 2. A relatively high yield of xylose (22.5 wt.%/95.5 mol%) was achieved. The degradation pathway of xylose was cut off through the formation of intermediate between xylose and maleic acid. 3. Maleic acid showed high selectivity for the conversion of hemicellulose from a wide range of raw biomass materials into xylose. This suggests that these results are especially significant in valorizing hemicellulose substrates to effectively utilize the raw biomass to its fullest. This work was financially supported by the National Natural Science Foundation of China (No.21536007) and the 111 project (B17030). The characterization of the residue from the Analytical and Testing Center of Sichuan University were greatly appreciated. Carvalheiro, F., Duarte, L. C., and Gírio, F. M. (2008). “Hemicellulose biorefineries: A review on biomass pretreatments,” Journal of Scientific and Industrial Research 67(11), 849-864. Article submitted: February 19, 2018; Peer review completed: April 2, 2018; Revised version received: April 15, 2018; Accepted: May 18, 2018; Published: December 6, 2018. Fig. S1. 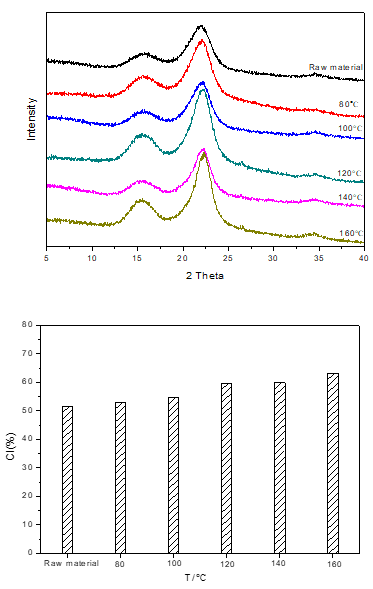 FTIR spectra of solid samples from 4000 to 400 cm-1 with different reaction temperature. (a) Full spectrum from 4000–400 cm−1, (b) Partial spectrum from 4000–2500 cm−1, (c) Partial spectrum from1800–1500 cm−1, (d) Partial spectrum from1000–400 cm−1. Reaction conditions: 3g (corn stover), 2 MPa N2, 0.06 M maleic acid, 2 h, 100 mL water. Fig. S2. XRD spectra and CI index of solid samples with different reaction temperatures. Reaction conditions: 3 g (corn stover), 2 MPa, N2, 0.06 M maleic acid, 2 h, 100 mL water. Figure S3. Positive ion mode of ESI MS/MS spectra of aqueous-phase products in aqueous solution with different temperatures. Reaction conditions: 3 g (corn stover), 2 MPa N2, 0.06 M maleic acid, 2 h, 100 mL water. Fig. S4 (a).the conversion of the three major components with different substrates, (b) The yield of liquid products with different substrates. Reaction conditions: 3 g (raw materials), 2 MPa N2, 140 ℃, 2 h, 100 mL water, 0.06 M maleic acid. 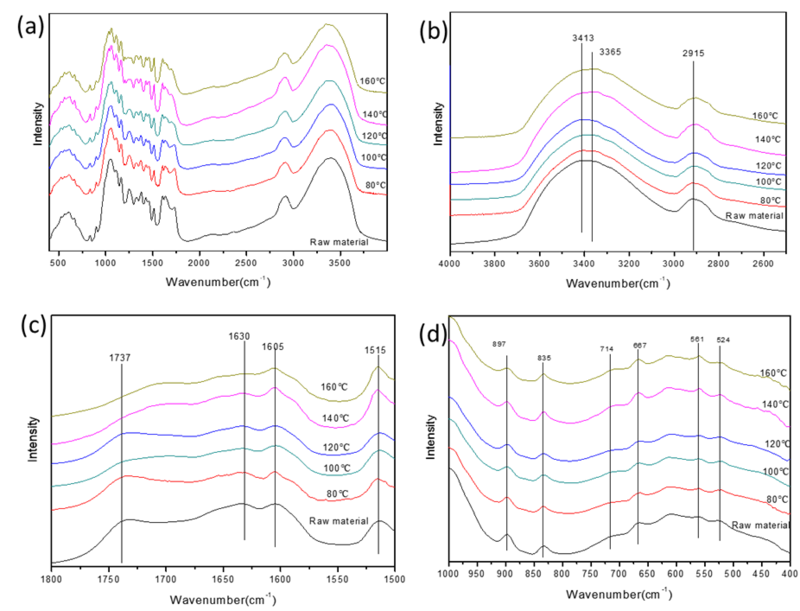 aThe frequency of Raman peaks based on the references (Gelder et al. 2007; Kim et al. 2012; Shih et al. 2011); bThe frequency of Raman peaks according to the Raman spectrum. bThe frequency of Raman peaks according to the Raman spectrum. Shakhseemampour, J., Jung, S. S., and Moskovits, M. (1994). “Raman study of the photochemistry of maleic acid adsorbed on the surface of colloidal silver,” Iranian Journal of Chemistry and Chemical Engineering 13(1), 30-36. Shih, C. J., Lupoi, J. S., and Smith, E. A. (2011). “Raman spectroscopy measurements of glucose and xylose in hydrolysate: Role of corn stover pretreatment and enzyme composition,” Bioresource Technology 102(8), 5169.